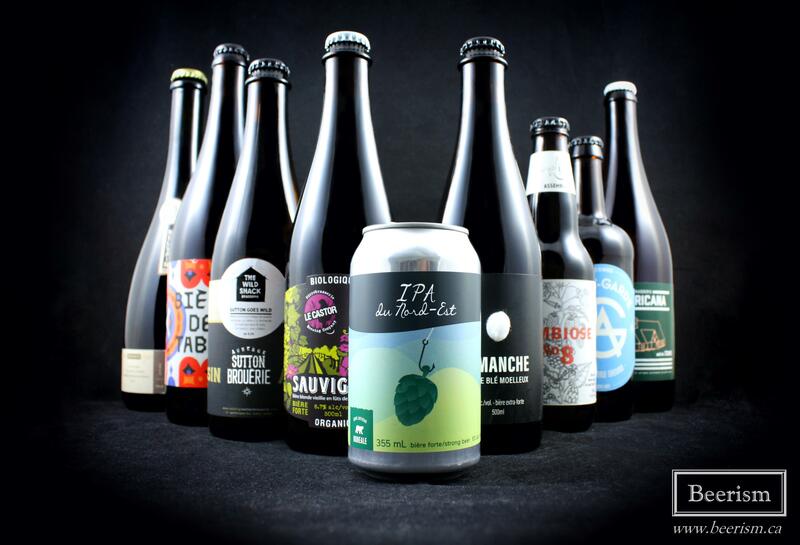 Home » Beer Reviews » Beerism’s Top 13 New Quebec beers of 2017! Beerism’s Top 13 New Quebec beers of 2017! 2017 has been a pretty momentous year for the Quebec beer scene. Several new breweries opened their doors, all kinds of new and amazing products hit the shelves, and for some annoying reason, lactose is on the rise (to be fair though, we didn’t start it). That said, there were two particularly crazy and polar opposite events that occurred this year. 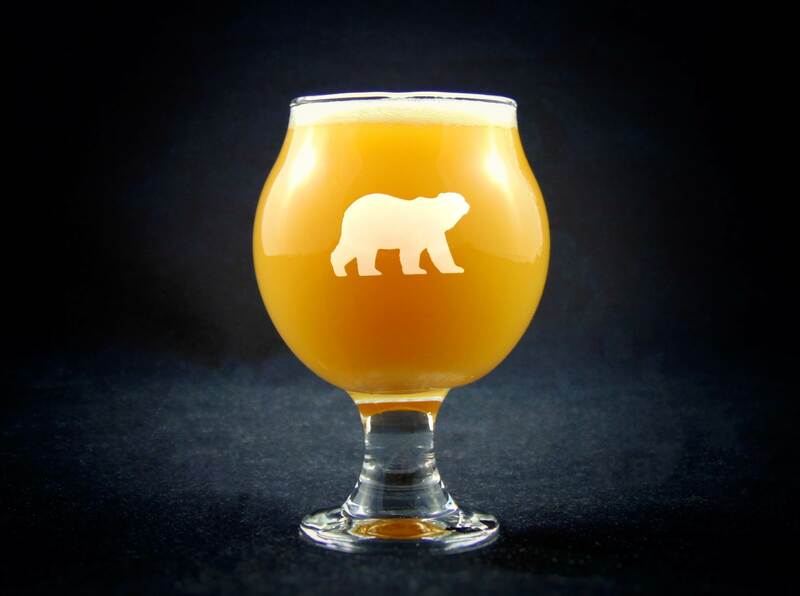 Boreale (a brewing titan not normally associated with “Craft”) released their incredible NEIPA – a beer that people actually line up for and continues to sell out in hours. And in contrast, Le Trou du Diable (a brewery very much associated with “Craft”) announced that they were joining the Six Points division of Molson-Coors. Needless to say, beer-geek heads exploded. Speaking of North-East or New England India Pale Ales, this contemporary take on the modern American classic has completely taken over the hop-scene not only here in Quebec, but around the world. Almost every brewery in the province has in some way attacked this style by creating a hazy, juicy, and generally luscious hop-bomb – all designed to quench the thirst of many ridiculous haze-crazed maniacs throughout our land (and yes, I’m on that bandwagon too). 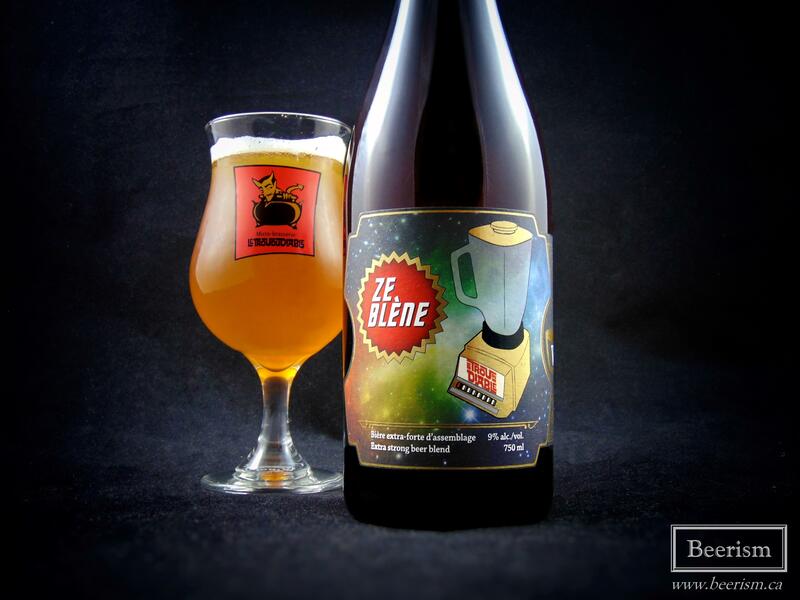 Probably the best thing that happened this year was that Microbrasserie Pit Caribou maneuvered through some red tape in order to allow for the production of 100% spontaneously fermented beer in Quebec, and then subsequently released the extremely sought after and well received Perséides (Quebec’s first spontaneously fermented beer). In general, Pit Caribou has simply killed it this year. Every year it gets harder to scale down my list of amazing beers – but I did my best, and got it down to 13. As usual, it’s important to know that this list is (1) 100% Quebec-based beers, (2) includes only bottled or canned beers, (3) only has beers that were bottled for the first time in 2017, (4) only includes one beer per brewery, and (5) is in no particular order. As well, the tasting notes for these beers are taken from previous articles that I’ve written. Given the number of bottles, this is clearly a long post, so feel free to simply browse if you don’t want to commit to the whole text. Enjoy! Well, let’s start with Le Trou du Diable, who despite now being owned by Molson, had an amazing year. Several fantastic barrel-aged creations dropped, including the return of Bretteuse, a brett barrel aged IPA that is a fan favourite amongst the Quebec beer community. That said, they also released Ze Blène, which really impressed me. Ze Blène is a monster. This 9% ABV blend consists of various beers having been aged in Calvados, Sauvignon Blanc, Banyul, and Sauterne barrels. It was created with a cocktail of wild yeasts and bacteria, including Sacch, Pedio, Lacto, BrettL, and BrettB. I’m excited to try this, but also worried that it could be a mess. Let’s see! The nose is a big mix of wine-soaked oak, stone fruits, and some dank earthy funk. Tangy grapefruit rinds and bright citrus essences sneak through as well, creating a rich and robust aromatic experience. The palate matches, with layer upon layer of complexity. Off the bat, there are rich vinous flavours, that showcase the apparent oak funk. It’s acidic and tart, but balanced and not challenging to drink. The bigger body and higher ABV help balance the acidity and add a nice richness to the whole thing. I’m not big into sours on the higher alcohol spectrum, but the 9% fits here, not being particularly apparent, while also adding a touch of sharpness to help dry things out. The fruity components are composed of mango, peach, and passion fruit, alongside potent grapefruit rinds. There is this great tanginess here, and when coupled with the plethora of Sauternes barrel juiciness, gives so much complexity to the drinking experience. This beer is legit delicious. It’s rich, but goes down incredibly well, while the barrel layers are just insane. Seek this out, it’s special. Microbrasserie la Memphré is quickly climbing the top Quebec ranks in my opinion. Although they don’t produce bottles extremely often, when they do, they are pretty damn stellar. This year, their “Dimanche ” stole my heart. I can’t wait to see what comes next. 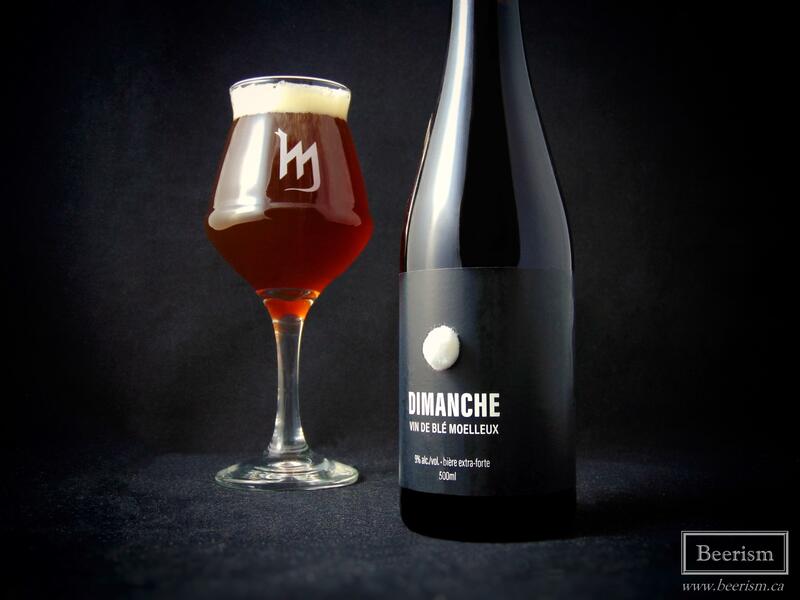 Dimanche is a bourbon barrel-aged wheat wine, brewed to celebrate that day of the week where we can potentially do nothing. Oh, and yes, that is a white pompom on the label. It pours out a clear dark orange colour, with some brown undertones. The nose is an inviting mix of bourbon vanilla notes, alongside some apple cider-like aromas, musty yeast phenols, and cooked caramel. The body is rich and robust all around, carrying lots of maple, caramel, cooked apples, and plums. Bananas foster comes to mind. Although perceivably sweet, it actually finishes very dry, with a surprisingly clean linger. The bourbon adds a nice complexity to the beer, with lots of vanilla and oak, as well as rich barrel elements and some drying tannins. You can have big beers that are too sweet, which come off cloying and unpleasant. While on the opposite spectrum, you can have big beers that are too dry, with either an over-zealous bitterness or an unwelcomed astringency. It’s hard to find that balance, but once again, La Memphré has done it. Dimanche is rich and robust, while still very dry and drinkable. Oh, and the body is out of this world. 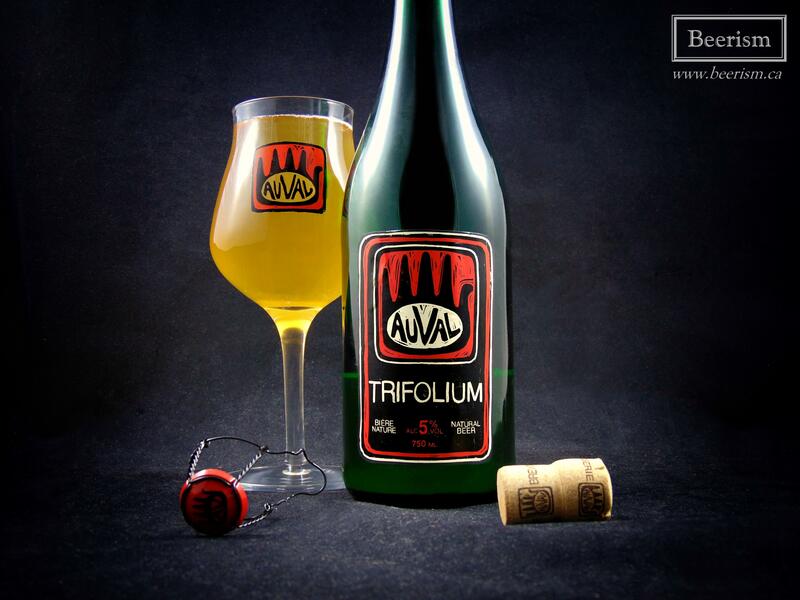 Next up is Brasserie Auval, who just like previous years, continued to kill it. Several amazing offerings returned, and many new bottles dropped. That said, the one that blew my mind was Trifolium. Although I’m not ranking, this is probably my favorite beer of 2017. Trifolium is a wild ale, barrel-fermented with a house-made mixed culture captured from wild clover in the region. The nose is a rich mix of dank, wine-soaked oak, alongside dusty brett phenols, some pear, apple juice, and grapefruit tang. It has a bit of a lambic-sequel aromatic profile. Extremely inviting. Up front it’s quite tart, bordering on sour, with a lingering tannic tang in the finish. There is a richness here, with several layers of complexity becoming more and more apparent after each sip. Tart green apples meet a huge oak presence, carrying loads of tannic wine dryness that lingers long after you sip. It’s not quite as dusty as a Gueuze, but the acidic layers and general flavour profile are extremely reminiscent of a quality lambic. This is an impressive beer. That said, there is also a linear drinkability to this, allowing the beer to be exceptionally complex, rich in body and flavour, while not being remotely hard to drink. 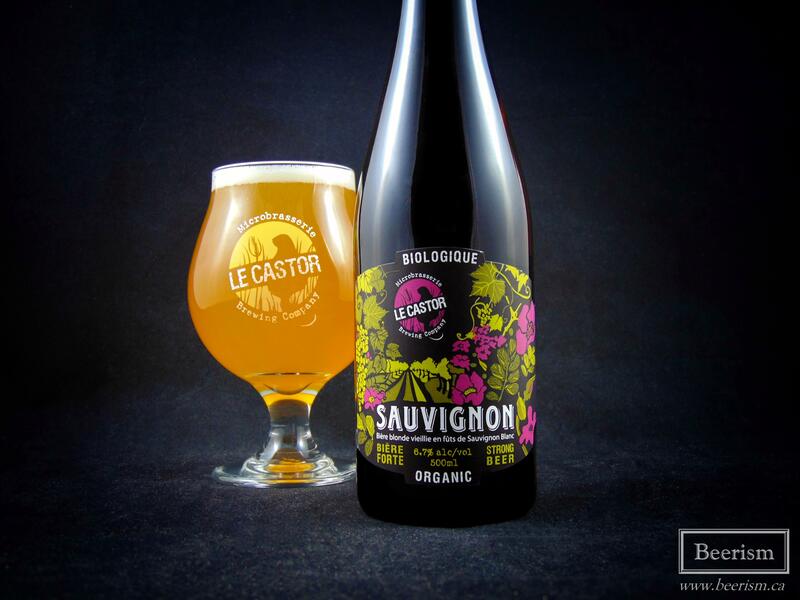 This year, Microbrasserie Le Castor has kept their wild beer momentum going, re-releasing most of last year’s offerings, along with several new ones. That said, their latest beer called Sauvigon was particularly impressive. Sauvignon is a Sauvignon Blanc barrel aged wild ale – and man, is it good. The nose is juicy and funky all at once. Loads of stone fruits come through, especially peach and nectarine. Grapefruits are also apparent, lending a tangy note that complements the dusty brett-induced phenols. It smells quite vinous as well, with some light oak in the background. The palate matches, with that pithy grapefruit thing turned up a notch – while still carrying a big peachy juiciness. Wine soaked oak tannins help cut through everything, but the barrel leaves a nice vanilla spiciness on the finish. The brett adds lots of earthiness, carrying a phenolic dusty basement and old books element that adds more complexity to the whole thing. The body is smooth and slick, with soft but ample carbonation. Overall this is the perfect combination of juicy esters and vinousness, with dusty funk and loads of oak. 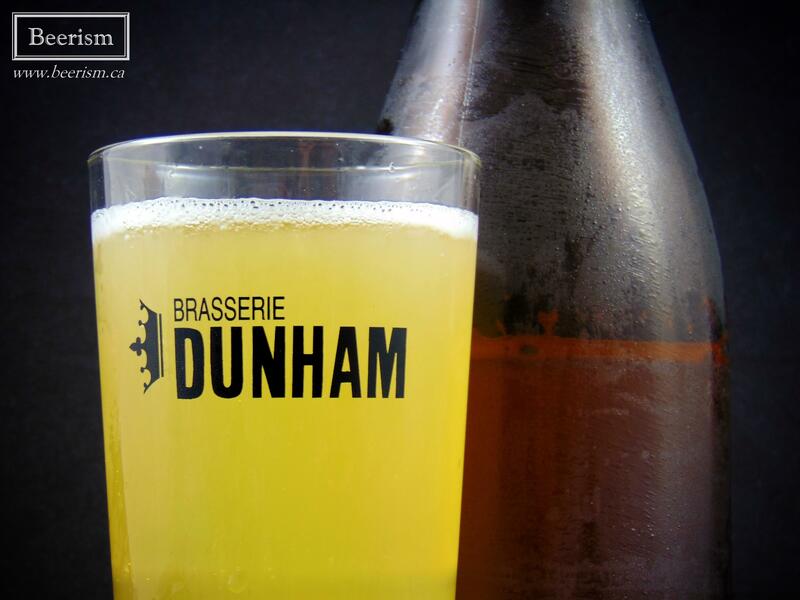 A few weeks back, I was in Dunham and had Bière de Table on tap. I thought it was stellar. When I found out that bottles would be sold, I was pretty damn excited. The nose is a lovely and subtle mix of bretty funk alongside light lemon-like acidity. It is simple but complex, carrying stone fruits and hints of spicy phenols. The flavour profile is similar, beginning with notes of dusty barnyard and a very subtle but still apparent acidity. This lends a citrus-fruit component, adding lemons and grapefruits in particular. The finish has a long and lingering lemon/grapefruit rind complexity that really appeals to me. It’s crazy dry, and goes down like water. I could drink this all day long. This beer might not impress all the beer-geeks, as it’s extremely subtle and even a tad watery. However, that’s what makes it brilliant. Packing this much complexity and downright deliciousness into something that goes down like water is a truly difficult thing to pull off. I Love this beer. 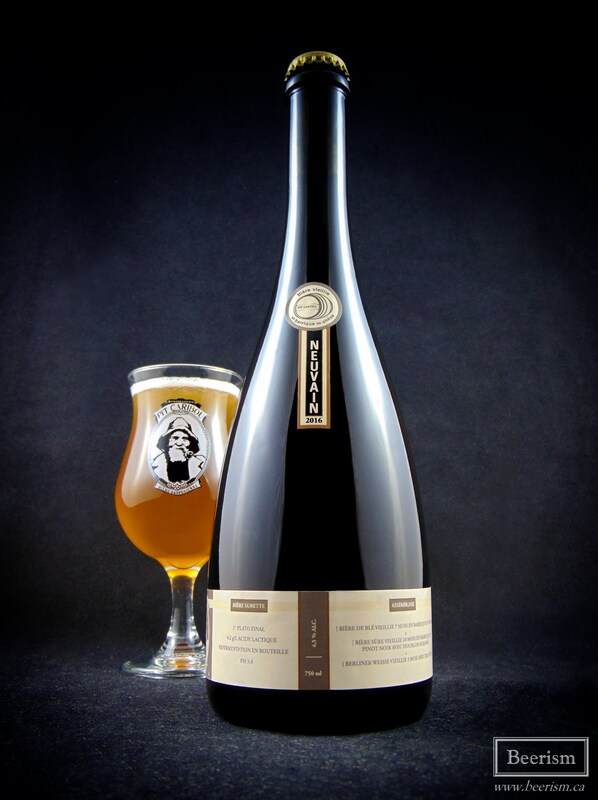 Although not releasing a slew of brand new bottles this year, Microbrasserie Dieu du ciel! still pumped out a few new offerings. My favorite was Symbiose #8. 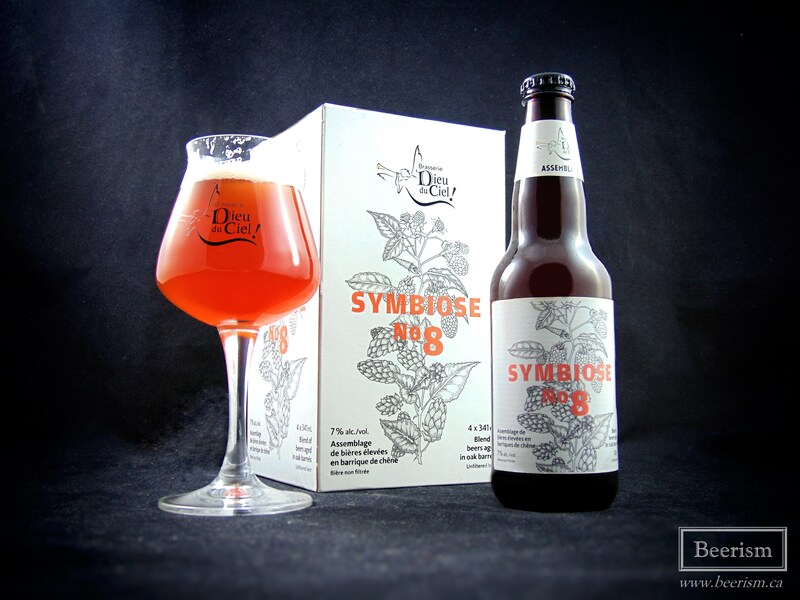 The Symbiose series by Dieu du Ciel! 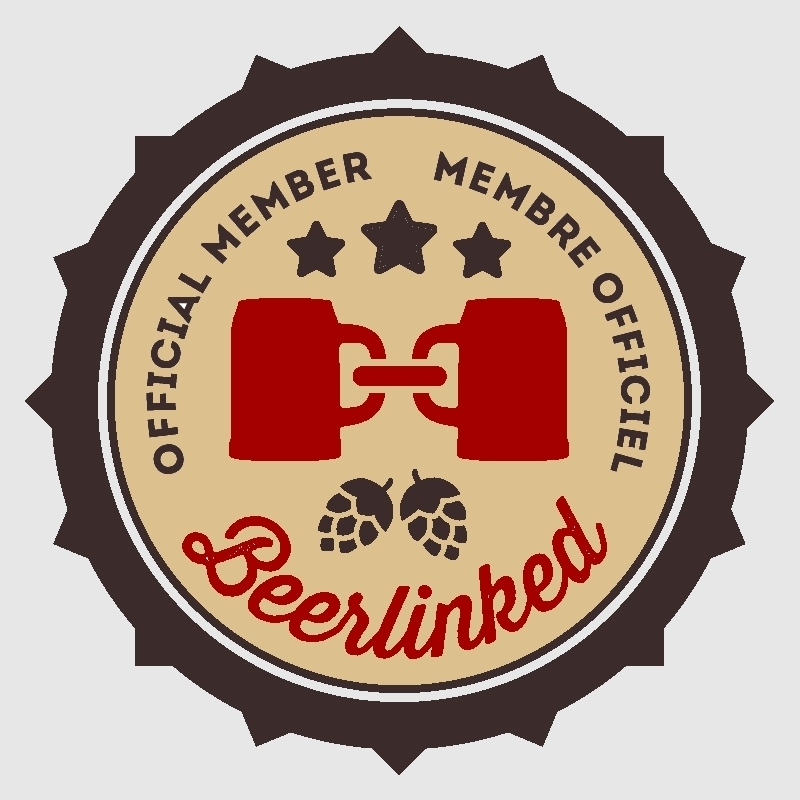 is a line of beer blends that differs with each release. Although this is the 8th version of this beer, it is only the second time we have seen it in bottles. This particular blend is Dernière Volonté (Belgian IPA), blended with Solstice D’Été Framboise (fruited Berliner Weisse), aged first in Pinot Noir oak barrels, then in second use Hérétique barrels containing brettanomyces. Symbiose #8 pours out a beautiful coral colour, with orange and pink highlights. The nose throws big jammy fruits at my senses, carrying loads of raspberry goodness. The spicey oak and bretty phenols mix perfectly with an acidic and drying berry aromatic bite. Up front it’s very tannic, dry and tart. The fruit isn’t in your face as much as the nose lets on, but there are still big jammy elements that add nice raspberry accents to the Dernière Volonté base. This blend’s acidic profile is well balanced against the Belgian pale ale base, with the raspberries and leftover hops busting with tangy goodness. The animal-like bretty funk is restrained compared to Derniere Volonté brett, and instead here, it provides extra fruity elements and drying phenols. This year’s blend is more round than the last batch of cherry Symbiose (#7). The body and subtle sweetness make a more substantial flavour profile, carrying a satisfying finish that lingers with tangy berries and some pithy citrus rinds. 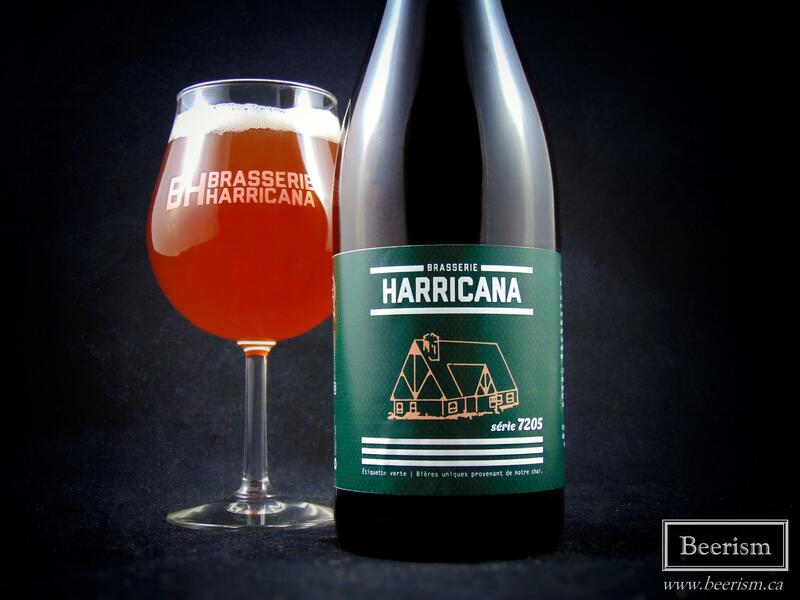 Brasserie Harricana has tremendously evolved and progressed this year, creating a killer barrel program as well as opening a new bottle shop attached to their downtown Montreal brew-pub. Amongst their barrel-aged beers was a special series called Série 7205. The third in this line was particularly amazing. 7205.003 is a sour ale, barrel-aged for 9 months with a cocktail of wild yeast and acidifying bacteria. It was then refermented in a single tequila barrel with Shiraz and Viognier grape must. The nose is a bright mix of dusty brett funk alongside lots of fruity notes of cherries and grapefruit peel. It smells extremely zesty, with loads of oak and acidic compounds. The flavour profile begins with a potent tannic dryness that takes over. As my palate adjusts, a roundness emerges, allowing the other flavours to come through. Huge fruity vinous notes are complemented by an apparent, but not too aggressive, acidity. Cherries, raspberries, and grape skin lend more fruity elements. Although being oak-forward and carrying lots of earthy and rich wine-soaked woody complexity, I’m not getting too much of the tequila – maybe just hints in the background. I really enjoyed this one. It had a bit of a lambic-like grapefuity tannic sourness, with a potent brett profile that added nice layers of earthy dank funk and even more fruitiness. Kudos! Max and Remi from The Wild Shack headed out to Auberge Sutton Brouërie last year, where they brewed one beer, which was split between four different Chardonnay barrels. Each barrel had a slightly different treatment, carrying various brett strains and souring bacteria. They rested in the barrels for eight months, and were then all blended together before bottling. 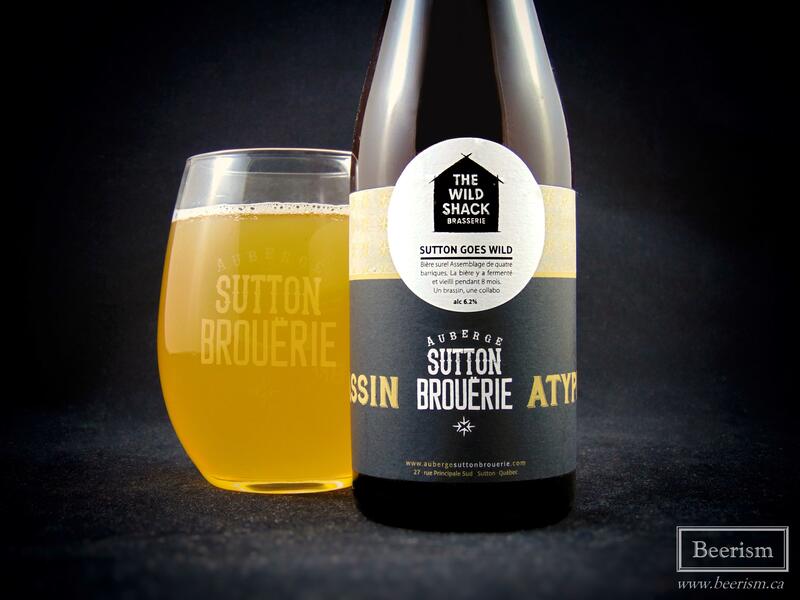 Both the Wild Shack and Sutton Brouërie had a tremendous year, so it’s amazing to be able to celebrate both of them with one single beer: Sutton Goes Wild. The nose is a great mix of dusty brett funk alongside citrusy acidic focused aromatics. There are also lots of tart apples, lemon zest, and white grapes. The oak is quite present as well, carrying rich, almost Gueuze-like elements – very vinous. Wow, this is really tangy and tart, with a lingering and balanced acidity. It’s fruity up front, carrying tons of peaches and tart green apple. The oak lends a spicy woodiness, while the various brettanomyces strains provide just the right amount of earthy drying phenols. The wine components are on point, tossing countless layers of vinous complexity alongside the juicy acidity (surprising given that these were second or third use barrels). This beer marries the intricacies of a barrel aged sour, with a drinkable and approachable base that goes down super easy alongside a subtle but apparent tartness. This is really quite exceptional. Kudos! As of last week, Les Trois Mousquetaire‘s head brewer Alex has left and moved on, co-creating a new brewery called Brasserie Distillery Champ Libre – 2018 will be their year! That said, the team at LTM had a great year, but it was their IPA Mosaic that really impressed me. It pours out like hoppy milk. The nose wafts gigantic fruity notes of tangerine, peach, and orange rinds. Piney resinous hops complement this tropical fruit bomb, alongside some grassy funk in the background. The palate matches, setting off a fruit explosion on my senses, with tangerine, grapefruit, pineapple, and passion fruit at the front. It’s dry to the bone, with a clean but piney finish that carries a subtle yet still apparent bitterness. There is a spicy hop intensity from the lupulin powder, which carries an explosion of zestiness, as if biting into underripe citrus rinds. It’s actually hot on the back of the throat, with a pungent hop acidity. As I was mentioning earlier, Microbrasserie Pit Caribou has had an extraordinary 2017. Their barrel program has been producing countless bottles. Every week there is something new. And the thing is, they are all very good. Very few if any were less than excellent. It all kind of started with Nauvin, and then bloomed from there. However, for me, it was still the best of the bunch. Oh man, this beer. Okay, so Neuvain is one hell of a blend. It consists of a whiskey barrel aged wheat beer, a Pinot Noir barrel aged sour beer made with aged hops, and a Berliner Weisse aged on peaches. This is quite the concoction, so let’s get to tasting it! The nose is a wonderful mix of microflora. Lots of acidic complexity, with plenty of barnyard and earthy Funk. It’s very gueuze-like. Some peach and apricot come through, with light vanilla and oak. Like the nose let on, there are lots of acidic lambic-esque components on the palate. Lemon and bitter grapefruit rinds mix with some light stone fruit complexity. The sourness is apparant but balanced, lending a tangy hand to the musty and earthy wild yeast funk. This really hits all the right notes, but does lack a tiny bit in the finish, not quite containing the lingering depth of a traditional lambic. However, I only compare it as such because of how amazingly it resembles the divine nectar found in Belgium. There is a wonderful sharp and bitter grapefruit rind finish that lingers on my palate. You do get the warming whiskey notes in the finish as well, lending a certain extra sharpness to the whole thing. The peach also makes itself more noticeable as it opens, with echoes of juiciness that adds extra layers to this already complex beer. Wow, this one really impressed me. 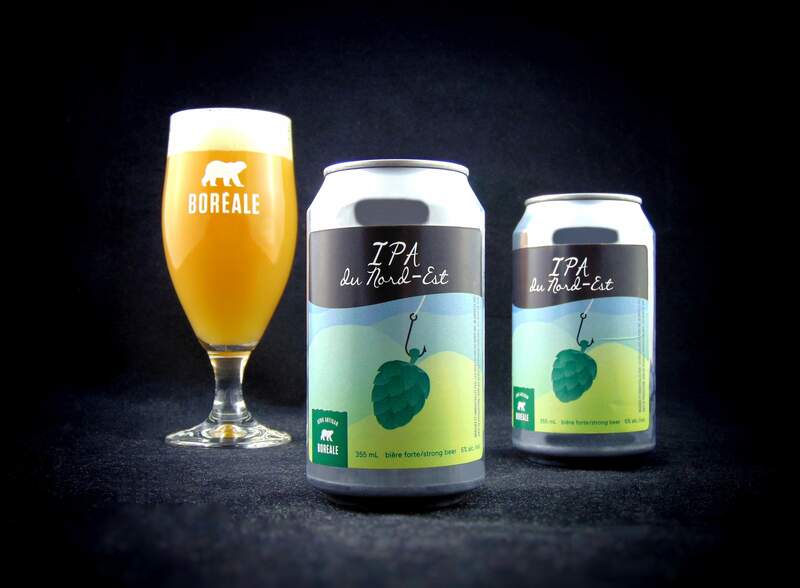 In 2016, Boréale launched their Épisode program, which is basically brewmaster Gabriel Dulong’s playground to create innovative small batch beers that would be available only at bars around Quebec. That said, the popularity of IPA du Nord-Est caused them to decide to can the beer, and then from there people lost their minds over it. With every subsequent batch, the beer got better and better. To me, this is one of, if not the best IPA in Quebec. The excerpt below is about the first ever batch, and although I raved about it at the time, it’s far better now. IPA du Nord-Est pours out a gorgeous hazy yellow orange colour, looking pretty much like a glass of freshly squeezed orange juice, with extra pulp (Tropicana Grovestand, baby!). The nose is a beautiful zesty mix of intense citrus forward hops. Lemon, pine, grapefruit, and general tropical goodness attack my senses. It’s dank, busting with freshness, carrying just a tiny grassy undertone. Although slightly muted, the palate matches the nose of the beer to a T. Where the nose was full of intensity, the beer itself is far more subtle. That being said, this juice bomb is still full of tropical delights, throwing big lemon, tangerine, and grapefruit at my taste buds after each sip. It has a nice funky and dank hop presence that carries a zesty and fresh resinous quality, which lingers on my palate. The finish is the perfect level of bitterness. It’s not too intense, but there is enough to keep everything in check. The balance is also on point, with juiciness meeting a minimal malt backdrop, nice tangy hops, and that slight cutting bitterness. 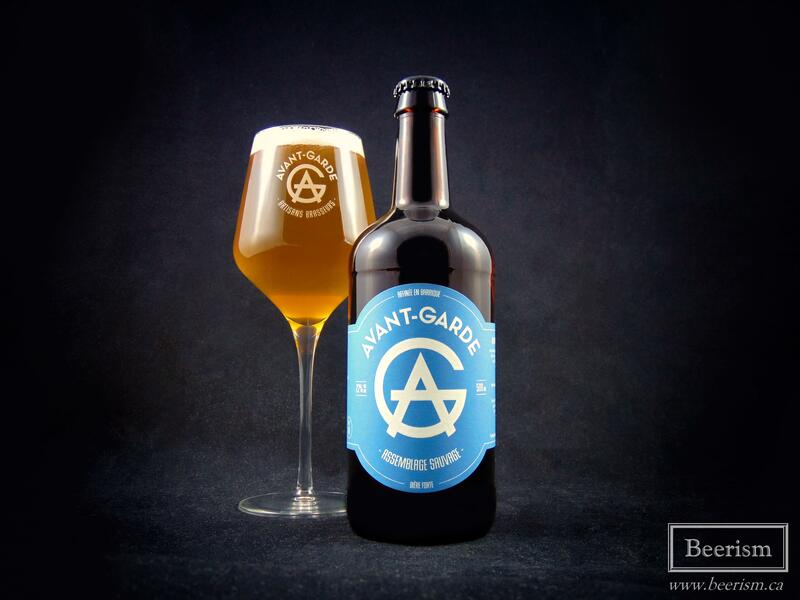 The contract brewery Avant-Garde Artisans Brasseurs stepped up their game in 2017 with two barrel-aged bottle releases. Although I enjoyed all their products, their first wild beer blend entitled Assemblage Sauvage was on another level. Assemblage Sauvage is a blend of Saison en Enfer, Funk et la Furie, and Wild #1, all barrel aged for 6 to 16 months in red wine and tequila barrels with a cocktail of wild yeast and lactic bacteria. It sounds pretty amazing! The nose is an awesome mix of rich wine-soaked oak and some funky brett phenols. Lots of apple and pear mix nicely with white grapes and light dusty books. It’s an extremely inviting experience. Up front it’s tart, bordering on sour, with lots of dry tannins in the finish. Like the nose, you get under-ripe apple and pear, mixed with white wine, litchi, and some vanilla oak accents. That said, a touch of tequila earthiness does come through, but it’s very hard to place, adding only a subtle layer to the whole thing. It’s all really well balanced and in harmony. The tartness is present, but not extremely sour, while the tannins also cut the beer further without adding too much mouth puckering dryness. It comes off round overall, delivering layers of wild phenols and lots of fruity accents. This is the best thing they’ve done so far (at least that I’ve tried). 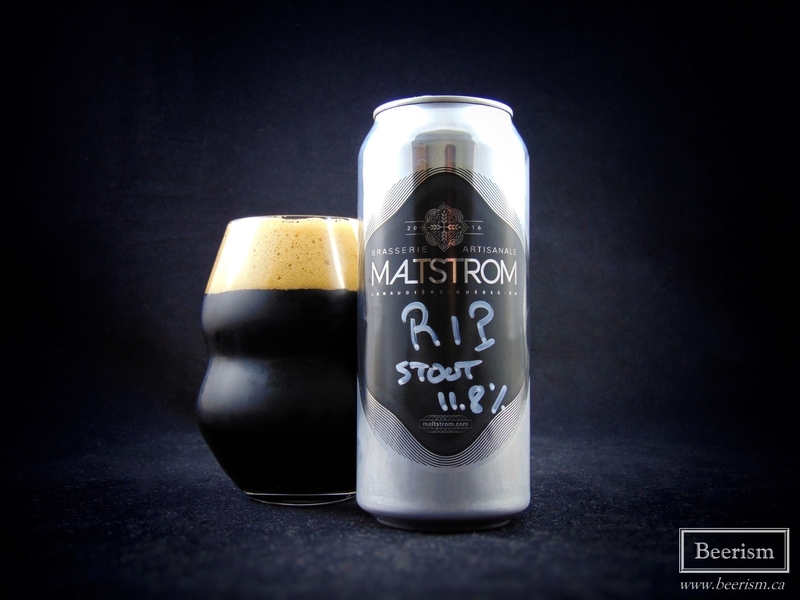 Although Brasserie Maltstrom kicked-off their main line-up towards the end of 2016, it was really in 2017 where they made their mark. Pretty much everything these folks produce is gold, but their RIP stout stood even taller for me. Apparently they brewed this stout with the intention of exclusively barrel-aging it before being released. However, it was so good that they decided that some of it needed to be sold to the public right away. And man, I’m glad they did. Sadly I never actually reviewed this one, but it was just too delicious not to include it here. RIP was intensely roasted, with an incredibly rich and robust body. The 11.8% wasn’t perceivable at all, and instead was smooth and creamy with huge chocolate notes. I can’t wait to try the barrel-aged version. First off, thanks for reading through! I know this was quite the long read. Every year the Quebec beer scene gains experience and grows with several new breweries joining the ranks. Brewers are producing higher quality products in general and our top breweries are now creating innovative beers that can rival what the Americans are doing. I can’t wait to see what happens in 2018! Cheers!